As a kid, who had no siblings, whose parents left home early in the day for work and come home late, life can be a lonely affair. Only if it weren’t for TV. As the month of June approaches, the summer starts winding down, today May 20th 2012, a little thing called nostalgia chose to hit and takeover my thoughts. I don’t know about others but I used to cherish the privacy, the option to spend your day however you like, watch whatever on the TV, listen to whatever new Indipop number that is playing on TV. Life was much simpler then. Mother used to leave at 7 in the morning, Father at 7:30. From then on, I chose to do absolutely nothing. I didn’t have a separate room, but slept in the main room of our house, right in front of the TV. Yogi bear, Scooby Doo and Captain Planet were my friends; the people I conversed without even uttering a word. Yes, my friends used to come over more often than not. To take to me the one place which helped us escape the oppressing heat of Bangalore(The phrase ‘oppressing heat’ got a whole new meaning when I lived in Chennai for a few weeks). Back in the day all you have to do was spend Rs. 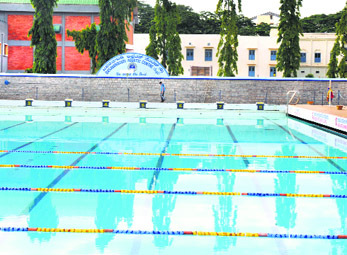 5 and you could spend 40 blissful minutes in the waters of Basavangudi Acquatic Center. At 1:00 PM, we used to start up our bicycle, rush to the pool to stand in the snake like line, jostle with kids our age for a ticket and then, the World slowed down. I loved water, but each time, after buying the ticket, when standing in the que, with the view of the blue coated water, my heart started, for some strange reason, to race; butterflies would enter my stomach. To this day I can’t seem to make out for sure if it was fear or extreme excitement to enter the water. Since, I swim even today, with regularity, I suppose it was the former. My dad used to leave behind exactly Rs.5, later Rs.8 when I grew wildly and they refused to accept me as a non-adult/kid. Not a Rupee more, nor less. Just enough. I wasn’t greedy either. I can’t believe how honest I was, or am, in the matters of money with my Father. To ask for Rs.2 for Bhel Puri and not eating Bhel Puri was blasphemy. As a kid, you develop strange notions; notions which with time changes. But, at that point, it is the ultimate truth, an unshakable fact, an unbreakable rule. Lying to my parents got easier, let me tell you. I blame puberty. Sending me to Swim camp is one of the greatest gifts my parents have given me. When I am in the water, the World stops being a pain, no worries of harder times to come, no thoughts of lost love, no regrets of wasted time, no feelings of indescribable nature. I am truly alive, doing the thing I have done for many years- swimming my laps, rejoicing the warm water, maybe subconsciously think of the great moments I have spent at the very place all those many year ago. The World becomes a better place. Even the thought that it being a public pool and that many kids could have done what I had done a few times when I was a kid myself- pee in the water- doesn’t enter my mind. As all good things, this ends too, with the lifeguards blowing their whistles exactly 40 minutes from the start. BM, as we used to call him, loved the water every bit as I did. He was 2 years older, but the love of the water united us. I wonder where he is now. We lost touch when he graduated high school and my moving out of Chamrajpet to Girinigar, sealed the deal. I owe him a great debt, in fact. He has bought me innumerable number of delicious, oily, utterly unhealthy Samosas and Bhel Puris when I didn’t have the cash to buy them. He and others used to drop anywhere between 10 and 12 PM and we all used to cycle our way towards the swimming pool. It was always the 1:30 batch. 12:30 was too early, 2:30 one was too crowded. Today I can afford many more Samosas and Bhel Puris but there is no BM to eat it with. One of the stupidest things I did then was to shower before I went the swimming pool. The logic was that before leaving the house, you have to take a bath, as my parents had drilled that idea into me. Not a moment I had thought of the foolishness to take a shower before going for a swim. BM used to bang his head and probably say, “Ninge thale ilva, swimming hogakkinna munche yaaraadru snana maadthara? (Are you out of your mind? Don’t you realize the foolishness of taking a bath just before going a swim?)”. But it was not the time to break the idea with simple logic. That time would come. Me and my friends smelling of the chemicals of the pool, would peddle our way downhill, with gay abandon, steering our bicycles with our bodies, rather than the generally accepted practice of using one’s hand, only to stop at the Bull Temple Road to buy some frozen-over flavoured ice or lollies as it was called. I still remember the price- 50 Paise. After cycling in the hot baking sun, that used to be the last thing each of us did before parting ways towards home. All would, they tell, take a bath when they get home, but I smiled at the fact that I had taken my bath before going for the swim. I had told them to follow my league, but they never listened. Thinking I was correct, I would later go to my Ajji‘s (Grandmother) place to play gully Cricket with the same bunch, smelling of the swimming of the swimming pool of Basavangudi. It tickles me to think that I used to stay fresh and cleanly bathed only few minutes everyday. Why am I telling you all these inconsequential stuff? Wait. . . If this is so inconsequential, then why do I think about it so much and derive pleasure from the very exercise? I remember the movie ‘Citizen Kane’. Kane is a very wealthy man and important man, who on his death bead utters the word “Rosebud” and dies. Smelling a story a journalist interviews every person who has had close contact with the Charles Kane to find out the meaning of the word “Rosewood”. He finds out from Kane’s butler that Kane had uttered this word once before when his second wife- Susan, had left him. In the ending of the film, it is revealed to the audience that Rosebud was the name of the sled from Kane’s childhood – an allusion to the only time in his life when he was truly happy. The sled, thought to be junk, is burned and destroyed in a basement furnace by Xanadu’s(Kane’s mansion) departing staff. If you haven’t already got what I am alluding to here, then let me specify: The days I have spent which I have described above are some of the happiest. I, like Kane’s childhood, lived in a simpler World; a World where I derived joy out of the most seemingly mundane routines, out of the most simplest of materials be it a Bicycle, a Samosa or a frozen-flavoured-ice; a World where Rs. 2 meant you can treat your friend for buying you a Bhel last time. On the bylanes of Mahant Layout, in Chamrajpet, next to Gavipuram Gutthalli, are the days I’ve based my foundations in, the strong roots using which I aspire to (curiously) fly. I never want to forget these moments, for they define me, for they remind me the things which actually matter. They teach me to stay grounded, help me be sane. These wonderful moments are my “Rosebud”. Me and my friends always fight over who is better- Aamir Khan or Shahrukh Khan. Its one of those debates which really don’t have a true purpose other than to pull the Shahrukh Khan fan’s leg. But, I got to say, me being a pro-Aamir Khan, got a massive boost last Sunday the 6th : Aamir Khan’s Satyameva Jayate, his first TV show aired that day. I am not going to shout down other contemporaries who have not gone the path of Aamir Khan, but want to genuinely appreciate what Aamir Khan has done and will be doing in the subsequent episodes of Satyameva Jayate, literally meaning “Truth alone triumphs”. This is a fantastic show. Although the female foeticide and/or female infanticide is rampant in India, not many people had the courage to talk about it, at least had the means of getting the message across to all sections of people and with such great impact. True, Aamir Khan being a household name and a star greatly helps, but that is the crux of the matter isn’t it. Aamir Khan has a life that most of Indians crave for. He didn’t have to go and do a show which will take up the issues faced by ordinary Indians. He could have been blissfully ignorant of the issues of India and could have happily spent the rest of his life in a bubble. But, he chose to look beyond himself, that many famous people (not all, obviously) seem incapable of. Do me a favour, stop reading, if you are, right now and go and watch the above video. I think the Shahrukh Khan vs Aamir Khan debate is pretty much settled now, don’t you think?